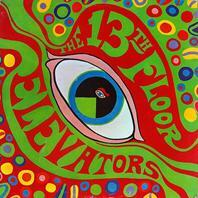 These guys didn't beat around the bush naming the album, cause just like Layla And Other Assorted Love Songs, The Psychedelic Sounds of the 13th Floor Elevators explains the content clearly. Well, in this case it's a little fibbing, since there are a couple of garage-rock songs also. First, it's one of very few rock-bands playing the jug as well as letting it have a semi-prominent place in the mix. Possibly even the only band for a number of years utilizing the electric jug. Second, it's the band that made Roky Erickson an underground legend (as well as the band that caused his schizophrenia to manifest, due to the excessive drug use). Thirdly, this is notable by being one of three contenders for the title of "first to have psychedelic in the title", possibly beating the albums Psychedelic Lollipop (which I was totally convinced I had reviewed here earlier) and Psychedelic Moods by a month.